The Rocky Patel Vintage Series premium cigars have received multiple 90+ ratings in cigar publications worldwide. 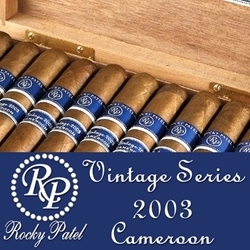 The Rocky Patel Vintage 2003 continues this highly-rated tradition with another amazing hand-rolled cigar line that features a perfectly aged 8-year old Cameroon wrapper, infused with Dominican & Nicaraguan fillers and a Nicaraguan binder. What make Rocky Patel so successful has been his ability to create superb tobacco blends for each of his high-quality premium cigars. The robust blends used in the Rocky Patel Vintage Series 2003 offers a medium-full bodied smoke producing flavors of sweet cedar wood, light spices and coffee ending with a delicately smooth and delightful finish. Smokers Discounts believes you'll really enjoy Rocky Patel Vintage 2003 premium cigars. We’ve made it easy and affordable to buy these handmade cigars online and have them delivered right to your front doorstep. Try the one of the varieties of sizes and flavors listed below at our online cigar store. Each of these styles are in stock today at a low discount price! Call us for more details!